Gary spent 20 years working in IT with hand held computers. Wanting something more caring-and-sharing and less stressful, he re-trained as a Podiatrist at the University of Northampton 2002 - 2005. 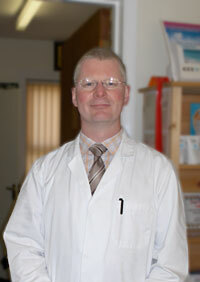 He has since undertaken research for the university into Podiatry and Inter-Professional Education, completing his Master of Philosophy (M.Phil) after 5 years in 2010, whilst establishing his clinical practice in Woodford Halse. In 2010 Gary took on a part-time post of Academic Support for the TIGER project at the University of Northampton. This project aims at Transforming Inter-professional Groups using open Educational Resources. The School of Podiatry at the University of Northampton has a deserved reputation for its bio-mechanical specialisation in foot related problems. It has a gait laboratory for walking assessments and specialist clinics for at-risk and diabetic patients, for sports patients and for children. This experience, plus placements within the NHS at Southwark in central London, in Bedfordshire and in Northamptonshire, has given Gary a broad view in assessing and treating a wide range of lower limb conditions. As with all Chiropodists and Podiatrists who maintain their registration with the Health Professions Council, initial training is supplemented by ongoing Continuous Professional Development. This seeks to ensure ongoing safe practice and that the latest treatment approaches are available to clients. Gary has broadened his expertise and facilities, to include assessment of suspicious moles (melanoma) which have the potential to develop into skin cancer. The pictures above show a suspicious mole along with magnified images produced by a Dermoscope. It appeared very dark to the naked eye, with an irregular boarder. A Dermoscope shines strong light through the skin and uses a gel layer to detract from surface scaling. This permits improved interpretation of depth and structure within the lesion. This example shows clear changes over a 21 month period, resulting in referral to the client's GP for removal and biopsy. This example proved to be a benign tumour, not spreading into deeper tissues or around the body.